A few weeks ago I learned that freezing extra-firm tofu, thawing it and pressing the water out makes it crumbly and more like ground beef. It still taste like tofu and you have to really use your imagination if you want to think of it as meat, but it’s good in its own right, nutritious and inexpensive. I’m happy to have a child who loves tofu, so I made this tofu chili just for her. Todd had left over Beef Bourguignon made with actual beef. 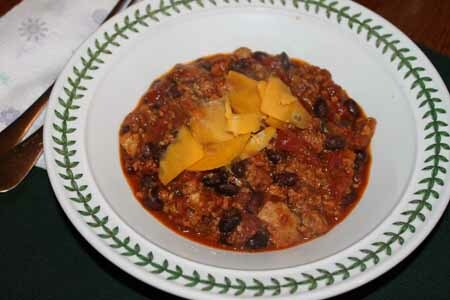 Chili is a personal thing, but this is a good start if you like chili that’s sweet and spicy but not too fiery. I used a little brown sugar to heighten the sweetness, but you can leave it out or use less if you want since the ketchup adds a little sweetness of it’s own. In all probability, it’s very likely you will do what many people do when they make chili and just change the whole recipe as you go! I guess the point of this is tofu is really good in chili and if you haven’t tried it yet, buy a brick of tofu, freeze it, thaw it, press out the water, and use it instead of beef. Let me know what you think. Heat the vegetable oil over medium in a Dutch oven or 3 ½ quart pot. Add onion and sauté 3 minutes. Add the garlic and tofu and sauté another 2 minutes. Add chili powder, cumin, ketchup, tomatoes, tomato sauce, brown sugar, cocoa powder and vegetable broth. Simmer uncovered for about half an hour. Chili should thicken as it simmers. If you want to cook it longer than half an hour, cover it up and simmer for another half hour to an hour. Add the black beans and cook for another 5 minutes or until they are heated through. Last week I tried a tofu recipe but substituted TVP granules for the ground beef. It was really good and since we made enough to last a week (only two of us in our family) it kept much better than chili made with meat. Have you used TVP? It is basically tiny little dried bits of soy protein. Its usually in the bulk bins in health food stores or sometimes packaged. Easier to sub for ground beef than tofu – you can either rehydrate it with broth to use as say, a sub for taco filling but in recipes with a lot of liquid (like chili) you just throw in the dry granules (give it at least 10 minutes cooking time but you can cook it a lot longer), add some extra liquid to the recipe, and you’re done. Super cheap and healthy. Jan, what I do is cut the tofu into 1 inch slabs, lay it on paper towels, press as much water as I can out of it by setting books on it, and then freeze it. However, I think if you plan on crumbling it you can just drain the tofu, throw it all in the freezer, then squeeze all the water out after you’ve thawed it (in which case they’re probably be a lot more water to press. How do you press the tofu? I love chili!I have some tofu in the fridge; I will have to try freezing it now! Thanks for the tip about freezing tofu, I’m going to have to try that! I’ve been wanting to try tofu-based chili for a long time. Looks yummy. Never thought to put cocoa or sugar in chili! It looks delicious AND healthy! Perfect on a day like today. I’m also sharing and caring and I’ve left an award for you on my blog. Check it out.